Cultural Heritage Lawyer Rick St. Hilaire: Lewis Defense Lawyers File Motion to Dismiss in US v. Khouli et al. Lewis Defense Lawyers File Motion to Dismiss in US v. Khouli et al. Even before trial begins and testimony is heard, the case against Joseph Lewis, II must be dismissed because the government cannot prove its case. That is what defense lawyers argue in a motion filed today in the US District Court, Eastern District of New York in the case of US v. Khouli et al. The lengthy memorandum of law contends that the government lacks sufficient evidence to proceed to trial based on the information supplied in discovery materials. Evidence in US v. Khouli et al. A federal grand jury indicted Joseph Lewis, Moussa Khouli, and two others in July 2011 alleging, in part, that Lewis illicitly bought Egyptian antiquities that were illegally imported into the United States through Dubai. The indictment also alleges that the four conspired together and with unidentified “others” in a smuggling operation. (A defendant is presumed innocent unless the government proves guilt beyond a reasonable doubt). 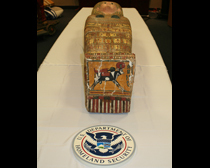 The objects involved in the case include a Greco-Roman style Egyptian sarcophagus and a three-part nesting coffin set. See here for background. Despite being accused of wrongdoing related to the import of ancient Egyptian antiquities, defense lawyers contend that Lewis was not involved with the importation process at all. In fact, the only co-defendant Lewis had contact with at any time was Moussa Khouli, and that contact was after any object was imported into the United States, according to attorneys. This argument is buoyed by defense lawyers' statements asserting that Lewis had neither sent nor received any emails discussing importation of cultural artifacts with Khouli. Therefore, Lewis' lawyers argue that Lewis had no participation in the import process. Lewis had every reason and motive to want the import process to be legal, the defense attorneys claim. Email exchanges between Khouli and Lewis never hinted at any illegal activity, they say. Lewis, in fact, never had any idea that any pieces were stolen, particularly after having been informed by Khouli in writing at least seven times that the Egyptian pieces were part of Khouli’s father’s collection in Israel during the 1960’s. Moreover, defense counsel contends that prosecutors cannot prove that the items in questions were stolen. They highlight that there has been no assertion by Egypt that the items are in fact stolen. And if the prosecution argues that the incomplete provenance of the artifacts should have informed Lewis that the objects may have been stolen, defense lawyers cite journal articles to show that lack of provenance is common in the antiquities market and does not demonstrate that a cultural object is in fact stolen. Lewis’ lawyers conclude that the lack of evidence cannot sustain a conviction, warranting a dismissal of the government's criminal case.